This is a massive, lovely park with bike and walking paths, a lake for boating, a formal Japanese garden, water parks (See “Rainbow Pool” below) and, in winter, an outdoor skating rink and Christmas light show. You could explore for days and still find treasures. (Not to be confused with the simple “Showa Park” in Tachikawa. See below.) 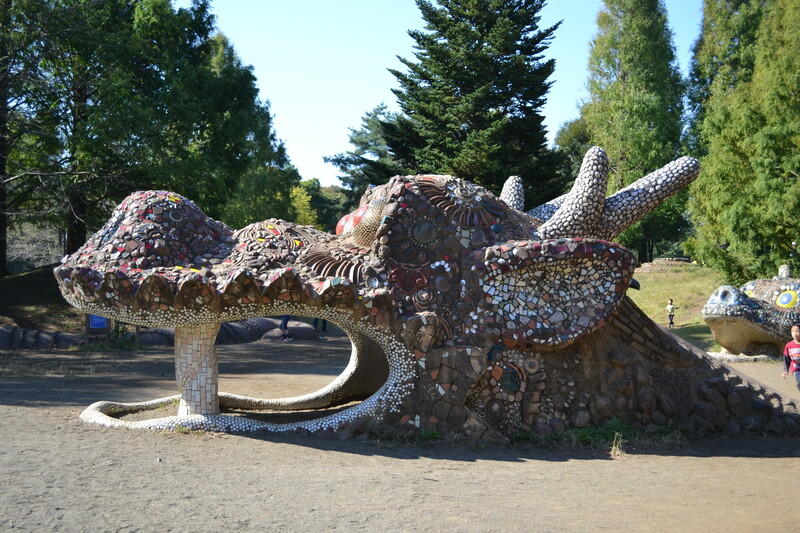 Among the many treats for kids are trampoline nets, roller slides, dragon sculptures and misty maze, but the park is probably most famous for its bouncing dome, a huge, marshmallow-like playground. (Sadly, a sign says adults aren’t allowed.) On windy days bring a kite to fly in the middle of the park. 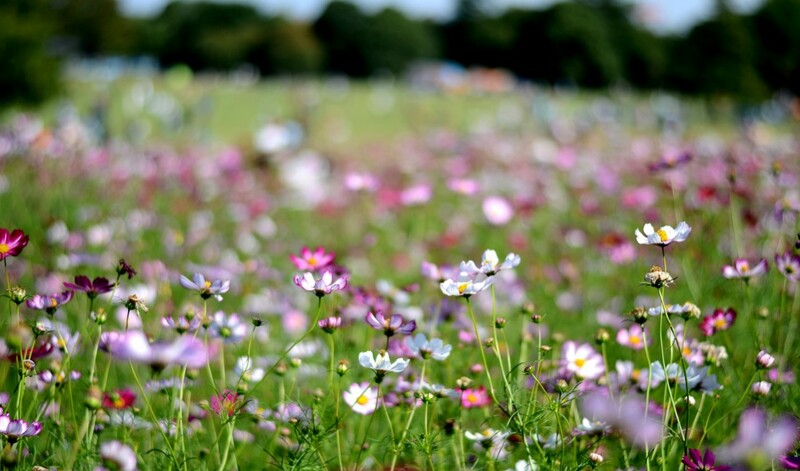 The park is especially lovely in spring, as a multitude of colorful flowers and blooming trees are a feast for the eyes. The cherry trees bloom in March/April and then the tulips come up. The tulip fields go on and on and are truly amazing – not to be missed. 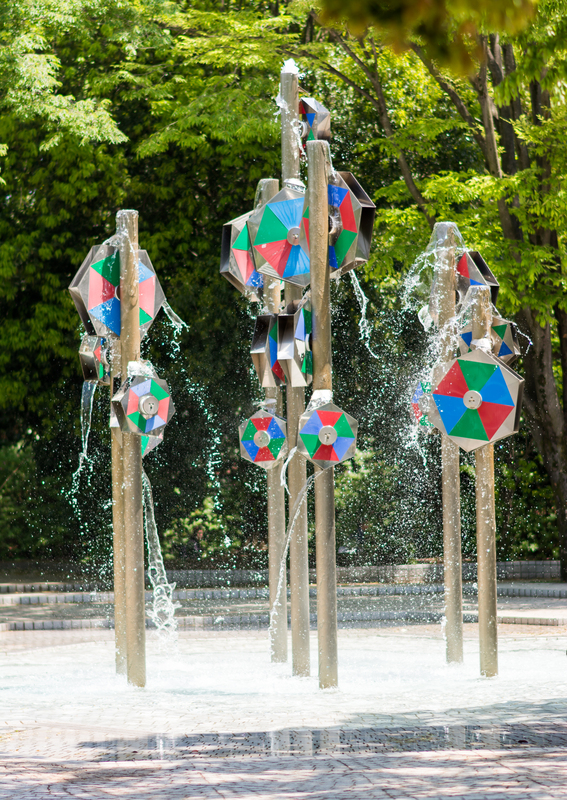 A wonderful water fountain greets you as you enter the park from the largest parking area at Tachikawa, so don’t forget to bring your camera. Also near several of the entrances are bicycle rental areas, but feel free to ride into the park with your own bike – there are several entrances to the park just for bikes in fact. Bike rental is just a few hundred yen for 3 hours. There are kids bikes, bikes with child-seats, and even tandem bikes for rent. However, if you are very tall, renting a bike may not be a good option. Bring your own picnic lunch or check out the small, but tasty restaurants and snack bars located near the lake and throughout the park. Dogs are allowed in most areas but must be on leash everywhere except the dog run. I’ve even seen people bring their pet cats and bunnies to the park. Admission is ¥400 per adult and ¥80 per child. Annual passes for adults are ¥4000. With an annual pass they will give you a plastic card with your photo on it and expiration date. Also with the annual pass you an get ¥100 off parking, which is normally ¥800. Hours: Park opens at 9:30am. Closes at 4:30pm in winter, 5pm in summer, and 6pm summer weekends. Open every day but Dec. 31, Jan. 1 and the last Mon. and Tues. of February. Rachael Keyser-McClendon. Liz Ruskin updated directions 2011, Sarah Straus updated 2013, Photos by Sarah Straus 2011. I think the Japanese Garden, located nearest the Sunagawa entrance, deserves its own section. This is a gorgeous, formal Japanese garden with a lake in the middle, streams, and waterfalls. There are three covered observation huts. Turtles swim in the water and bask on rocks. Don’t miss the bonsai demonstration in the back of the garden – filled with the most amazing bonsai. 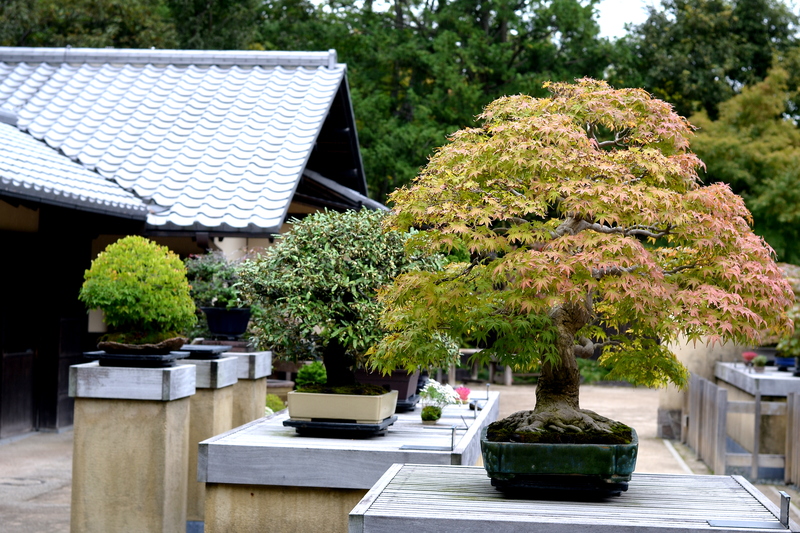 There is usually a man there working on one of the bonsai and it is so interesting to how he trims each bonsai with such care. You can’t bring food into the garden, but you can drink tea there in a small tea house (in the photo above the tea house is the building on the right). It costs ¥500 for tea and a sweet snack. Come in November to enjoy the fall colors. – Sarah Straus, Oct 2013. Located nearest the Sunagawa entrance, Komorebi Villiage is made to look like a farm on the Musashino Plain in the 1950’s and 60’s (ref: webpage). Having passed by this area many times, we finally stopped in. What a gem! There are demonstration gardens, a large thatched roof farm house, a beautifully designed thatched roof storage house, and water wheel. 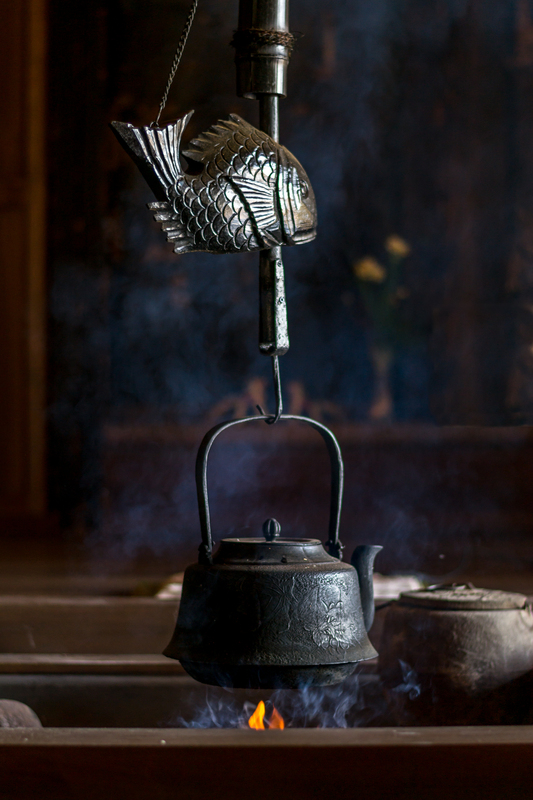 Volunteers place a kettle over a flame in the farm house and they are happy to talk about the village with visitors. I’m looking forward to seeing this place in the spring! Opens at 10am and has an earlier closing time than the rest of the park. – Sarah Straus, January, 2014. TRAIN DIRECTIONS: From Fussa Station take the train towards Tokyo to Nishi-Tachikawa, about 15 minutes and ¥160 per person. Take the North Exit of the station and the park entrances is steps away. DRIVING DIRECTIONS: There are three parking lots for Showa Kinen and additionally several bike/pedestrian entrances. The closest parking lot to the East gate (about 2 miles away) is the Sunagawa parking area. The next closest is the the Tachikawa parking lot, then the Nishi-Tachikawa parking lot. Parking costs ¥800. For all parking lots, turn right out the East Gate (0km). Turn left at the first light and drive until this road ends at the canal. Turn right, onto Route 59. At 2.2km you’ll pass under a set of railroad tracks. 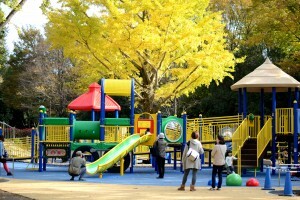 Sunagawa Parking: . Keep going straight after you go under the tracks. Drive until 2.8km. Here you’ll see a four-lane boulevard appear on the left. (It’s a “T” intersection, so the boulevard does not continue on the right. It is at the fourth light after you go under the train tracks.) Turn left here. Drive until 4.2km and turn right into the Sunagawa parking lot for Showa Kinen Park. This lot is closer to the children’s forest and bouncing dome. You can enter with your own bike and/or rent bikes at this entrance. During the summer a shuttle will take you from this parking lot to Rainbow Pools. GPS Coordinates to parking entrance: 35.72047, 139.39909. Tachikawa Parking: Pass the Sunagawa entrance and keep going to the next opportunity to make a hard right hand turn. Essentially you’ll be driving around the outside edge of the park. This is a large boulevard with trees. You will pass a fire station. Look for the Tachikawa parking entrance on your right. This the largest parking lot and the entrance near the large fountain. During winter find the christmas lights show here. You can rent bikes at this entrance and a shuttle will take you to Rainbow Pools from here during the summer. GPS: 35.703842, 139.403413. Nishi-Tachikawa Parking: Pass the Tachikawa entrance and keep going to the next opportunity to make a hard right. You will just continue to drive around the outside edge of the park. Go under the pedestrian bridge and turn right into the park area. This parking lot is at the same entrance as the Nishi-Tachikawa train station. This parking lot is very close to Rainbow Pools and to the lake where you can rent paddle boats. No bikes at this entrance. If you bring your bike, you’ll have to find one of the two bike entrances further down in either direction. GPS: 35.704731, 139.392319. 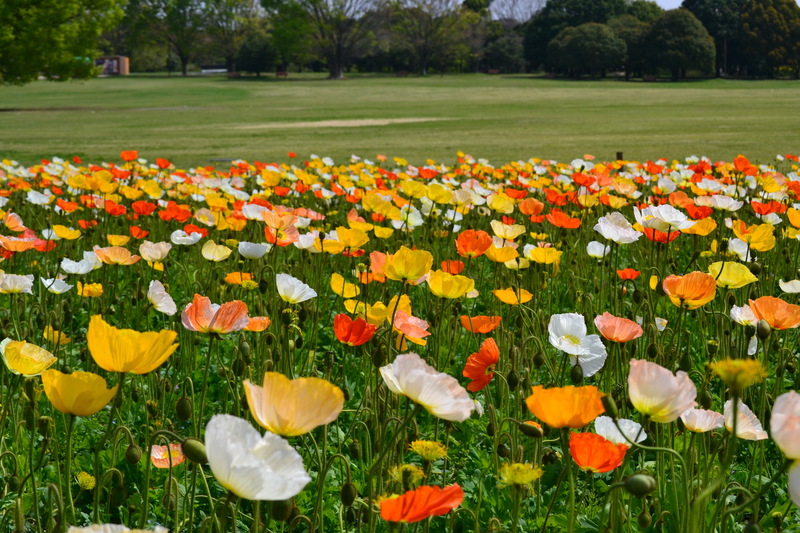 BICYCLE DIRECTIONS: Showa Memorial Park is a 25-minute bike ride from the East Gate. Ride out the East Gate. Take a right, then immediately take the first left—almost straight out the gate. Take this small, quiet road alongside the parks until it dead-ends into the big road. Walk your bicycle across the street at the cross-walk, turn right, then cross the river just beyond the road as soon as you can. You will find a wide, quiet bicycle path that winds its way among trees along the river all the way to an entrance to Showa park exclusively for bicyclists and joggers. Click here for shortest Bike Map. See below for most pleasant bike map. Winter Illuminations Showa Kinen Park has a nice lights show during December. It is located at the Tachikawa entrance. When I went with my kids we walked the area, ate a snack and did the little lights maze in one hour. There are about 12 food booths scattered throughout the area. For us it was a good destination on a school night, close and early enough to get home by the kids bedtime. Park at the Tachikawa parking lot and pay just ¥200 to park starting at 4pm. The lights come on a 5pm and end at 9pm. The entrance fee is the same as during the day or you can get in free if you have a season pass. In 2013 the show runs from Nov 30th through Dec 25th. – Sarah Straus, Dec 2013. Rainbow Pool & Water Park in Showa Memorial Park This place is a treat on a hot day. 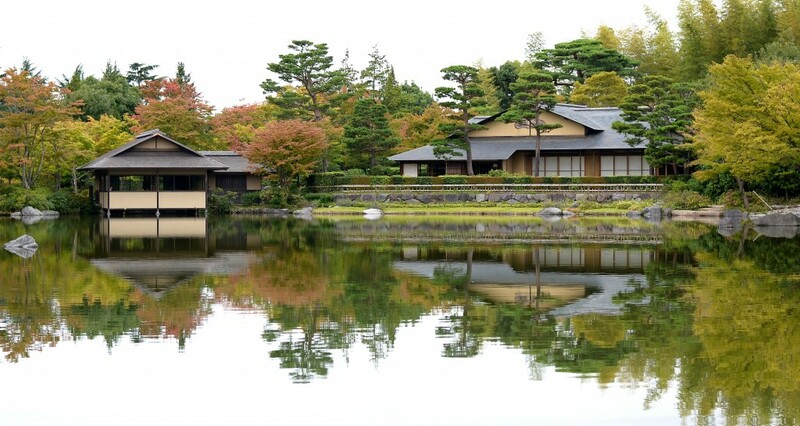 It’s fun, fabulous and close to Yokota. We recommend parking at the Sunagawa Parking Lot, approximately four kilometers from the East Gate. (See “Showa Memorial Park” above for driving directions.) Once inside, take the free park shuttle bus from the gate to the water park. The stroller-friendly bus picks you up behind the bike rental. The standard price is ¥2200 for teens and adults; kids ages 6 and up ¥1200, ages 4 and 5 is ¥300. Age 3 and under are free. However, if you pay with your suica prices drop to: ¥2000, ¥1000, and ¥200. Little kids will like the gradual entry wave pool (photo above). The pool is HUGE and the waves are mild. There is even a shady section of the wave pool. Older kids will be plenty entertained, too. There are large water sides, a small water slide for little kids who can sit on a parents lap, a lazy river, a pool with waterfalls, two large pools and a spray park. You might want to bring a tarp and anchor it down with all your floaties and pool toys to claim your space. (There’s a compressed air pump just outside the dressing rooms so save your breath for screaming down the water slides.) You can also bring a cooler and a shade tent. •Save that stub! You’ll pay ¥400 to enter the park. Save your receipt to have this amount deducted from your pool entry price – or just pay for the Rainbow Pools at the park entrance. However, you can also just buy the water park tickets at each gate. •The magic of Suica: Show your Suica or pay with it and the price drops to ¥2000 adults, ¥1000 kids, ¥200 for ages 4 and 5. •Come late! After 2pm, entry price drops to ¥1100 adults, ¥600 kids, ¥150 ages 4 and 5. •Come often! If you think you might be a regular, go for the ¥6000 season pass, good until early September, kids season pass ¥3000. Ages 4 and 5 season pass ¥700. •Come pregnant! Expectant moms pay only ¥500! 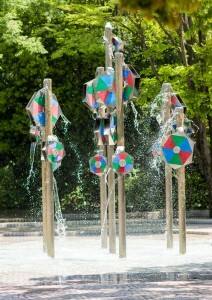 Showa Park is an old-fashioned city park. There are a few small shrines, a five-tiered pagoda and assorted playground equipment. There are open areas for playing ball or soccer, a jogging track and a small animal zoo. It is shaded by trees and is a pleasant place for a picnic lunch. Vending machines for drinks are available. This park is free and easy to reach by car; free parking is available. Note: Showa Park is not the same as Showa Memorial Park (Showa Kinen Koen), at Nishi-Tachikawa station. Showa Park is a block south of the tracks and closer to Higashi-Nakagami station. Open daily from 8:40 am until 4:50 pm. DIRECTIONS:? Diane Cressman, Melody Messer, Patricia Caldwell date? This entry was posted in Daytrips, Kid Stuff, Seasons, Sports & Outdoors, Spring, Summer, Tachikawa Parks & Sights, Top 5 Kid Stuff and tagged parks, Sightseeing. Bookmark the permalink. 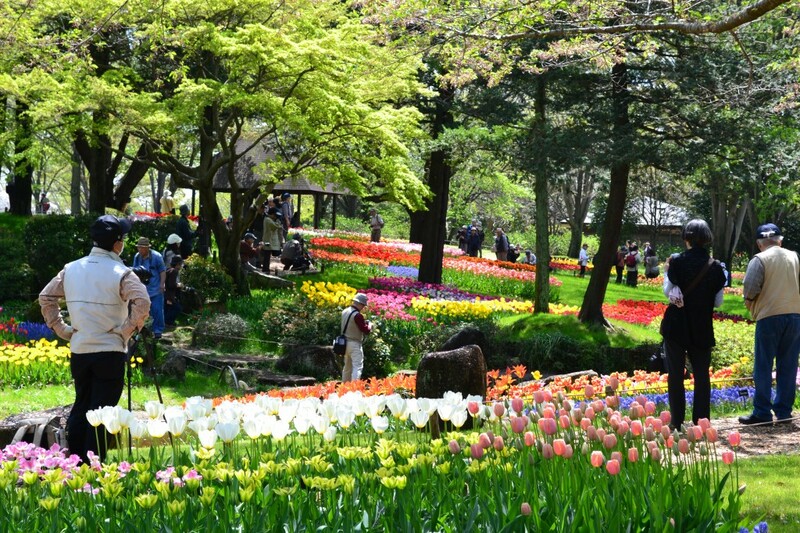 Showa Kinen Park in Tachikawa is a great place to visit. It is so large I couldn’t explore every part of the park. I enjoyed the Japanese Garden a lot. Today I bought my second annual pass to Showa Kinen Park and it is so worth it. It costs 4000 yen which is equivalent to the price of entering 10 times. I use it often: sometimes I go for the full day with the family, but I also use it for shorter trips by bike or to use the playground for an hour with my daughter. The annual pass doesn’t include parking or the water park that opens during the summer, but it is still a great deal. To get an annual pass just ask at the main entrances for the application. They collect your address and phone number and will take your photo. They will let you in and then have your pass ready for you when you leave the park. With the annual pass I am more inclined to visit the park and find that I take greater advantage of everything Showa Kinen has to offer. I agree with the annual pass. You’ll get a parking discount with the pass as well. If you pay an attendant (weekends) they will deduct 100 yen from cost. If you use the machine, just press the button for a receipt and show your pass at the Park gate with the receipt and they will refund you 100 yen. Wow! I didn’t know this about the parking. This is my second year with an annual pass for Showa Kinen and I never thought to ask about parking. Thank you Jim. We visited Rainbow Pool today for the first time and it was amazing! We went after 2pm to take advantage of the half off prices. It was still plenty of time, and definitely the least busy time of day. It was so much bigger and better than I’d imagined. There were 3 big slides for adults, a few smaller slides for kids. I have a 4yr old and it was perfect for her! So much to do! The lazy river was great, and the zero entry wave pool was perfect. You can take in your own food, and they also have several options of things to buy there. We took a tarp to secure our spot & used it as the ‘base’ to keep our snacks/bags. I’d highly recommend the place for anyone-with or without kids. The website for the rainbow pool has changed to http://www.showakinen-koen.jp/2015poolopen/pay.html. I guess the year change matters. Great place! Any idea when the Japanese kids go back to school so it isn’t so busy?